What is a Common Marmoset? Common marmosets are a type of monkey. 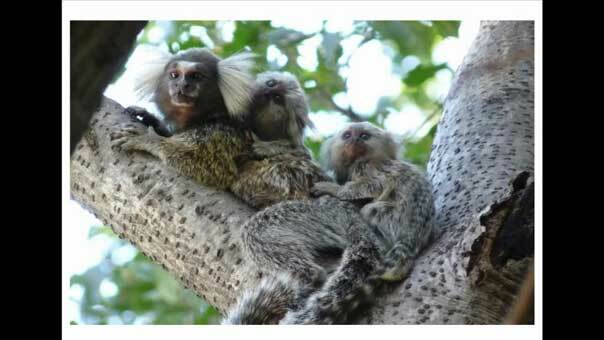 They are a particular species of marmoset in the genus Callithrix. Their scientific name is Callithrix jacchus. They have distinctive large white ear tufts and their tail is striped, with alternate wide dark and narrow pale bands. Their coat is grey, black, brown and white with streaks of orange. Originating in the Atlantic Coastal Forest in Northeast Brazil they have also been introduced to some parts of South East Brazil, including some urban areas. They are arboreal and weigh less than a can of baked beans. Claw-like nails allow them to cling to trees. In the wild they live in small family groups of 3-15 individuals. Their day is spent socialising, and finding and feeding on gum, insects, lizards, snails, fruit, flowers and nectar whilst staying alert to danger. Marmosets need expert care. They should not be kept as pets.